Announcing Weight Loss, Energy, Strength, Sexual Vitality, and Better Sleep …. All in one tiny little shot! I have been talking for years about the benefits (including those listed above) of improving Growth Hormone levels (measured by IGF-1 on lab tests). But there have been two issues which holds most people back in accomplishing this goal: 1) intense government regulations on the use of Human Growth Hormone (HGH). 2) the high cost of purchasing HGH. I have monitored my patients IGF-1 levels at least once yearly . . . and the majority have never been in the optimal category for maximum benefit, that is, 250-400 for males and 200-325 for females. The reason, again, is the limiting issues above, mainly the cost (average $500-1500 per month!). Now, we have a more reasonable option that has no government regulations holding us back and cost only about $100 per month. What am I talking about? Sermorelin (pronounced ser-moe-REL-in) is a Growth Hormone Releasing Hormone (which is made in the hypothalamus and directly stimulates the Pituitary Gland to make and release HGH and intervals throughout the day) Analog. GHRH is a 44 chain amino-acid peptide which was replicated and available a number of years ago for home use (called Geref) but was taken off the market— though not for any safety issues. Sermorelin is a synthetically produced replication of the first 29 amino-acids in that poly-peptide chain. 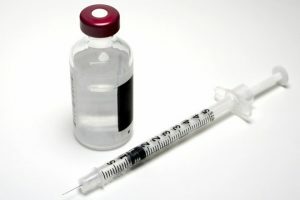 When injected at bedtime sub-Q in the upper abdomen 5 out of 7 nights a week it acts like GHRH in its stimulation of the Pituitary to begin producing more HGH. For those already taking HGH, it is possible that you would respond to Sermorelin and may not need the HGH. In some ways it is better (not just cheaper). Unlike a daily bolus of HGH, Sermorelin acts by mimicking the effect of GHRH causing micro-burst releasing of HGH throughout the day. This has a much more positive impact on your physiology enhancing the restoration properties of HGH. One thing unique to Sermorelin as opposed to HGH is the improvement on natural sleep cycles in the brain resulting in more restful sleep patterns. For some you on HGH, it can be used in tandem with HGH allowing you to decrease the dose of HGH by at least half, thus saving in cost, but maintaining your excellent IGF-1 levels. For most people, it finally provides an opportunity to “get in the game” of optimal health by addressing suboptimal IGF-1 levels which have been marginalized because of the high cost of the solution. Our staff is happy to answer any questions you may have about your particular situation and the potential benefits of using Sermorelin. If you would like to get started, and you are an appropriate candidate, you can start immediately by calling our clinic and letting our team know of your interest. *DISCLAIMER: Sermorelin is provided by prescription only to patients of Dr. Mark. Please keep in mind that Midwest Compounders will make up the 3 month kit including Sermorelin, the mixing diluent and all needed syringes. Your cost, including shipping, will be $320 per three month supply. You would pay us here at Rock Creek Wellness. Midwest Compounders would drop ship it to you in a few days. Also keep in mind that your maximum benefit represented by your increasing IGF-1 levels may take up to 6 months. Therefore we recommend that if you want to see if you can benefit from Sermorelin, you would need to make a 6 month (2 kit) commitment. We can re-measure your IGF-1 levels up to monthly if you would like but our default schedule will be at 3 months and 6 months to fully evaluate whether or not long term use of Sermorelin would be recommended. I am excited to help many of you who have not reached some of your goals (especially including weight loss) that might benefit from this missing piece of the puzzle. Let me know if you have any questions, otherwise just call to get started on Sermorelin right away.